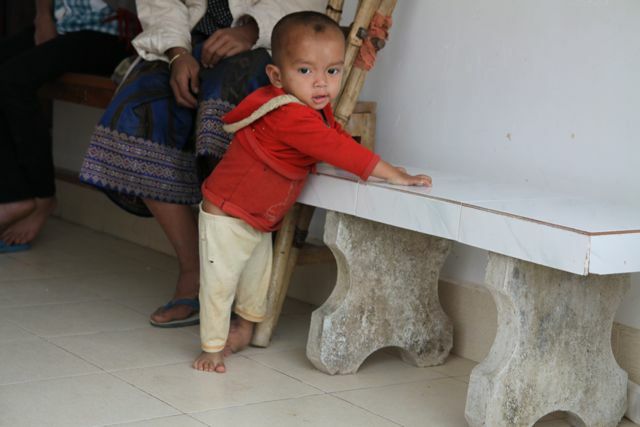 One-year old Pome faced a bleak future if he could not get treatment for his foot. He was born with a birth defect known as “club foot” (talipes equinovarus) but had never received medical care. People in his village knew him as the boy “with his foot on sideways”. His parents had no knowledge of treatment options. Fortunately for Pome and his family word reached us while working in a village some 20 miles from his home. We made our way to his village and convinced Pome’s family to let us take him to our friends at COPE: the Cooperative Orthotics and Prosthetics Enterprise. When we met the family it was nearly the end of the dry season. We knew that if we didn’t act promptly Pome’s treatment would be delayed due to the coming torrential rains. The following video shows our earliest interaction with Pome and his family and the wonderful treatment he ultimately received at the regional COPE clinic. We trust you’ll find the video uplifting, heartwarming, and even humorous. For once, a story with a happy ending! I just learned of your organization in Sierra Club magazine’s article. I am so happy to hear of the help you are providing. We wonder if the little boy will have to go back to his village and make the return trip for all 6 cast changes, the surgery and the follow-up treatments. How will that happen when your team won’t be there? How can they care for that cast and keep it clean enough to avoid infections in a house that probably has a dirt floor? It would be hard enough here! Any idea how long the whole process will take?